Poverty, hunger and famine are the common problems of Sub-Saharan African countries. International organizations, affluent countries and philanthropic institutions provide development aid to Sub-Saharan African countries in order to deal with these problems. Together with member states, the European Union is one of the largest providers of development assistance to Sub-Saharan African countries. 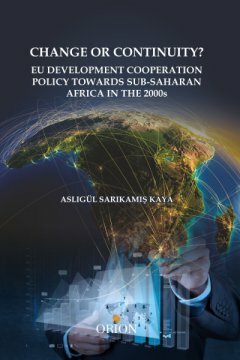 This book examines the EU's relations with Sub-Saharan African countries with respect to development cooperation policy. It investigates the actors and instruments of the Union's development cooperation policy towards sub-Saharan Africa over the past decade. It provides a comprehensive analysis of recent changes in the EU development cooperation policy and explains the implications of these changes for Sub-Saharan African countries. "Themis, Medeni Hukuk, Birinci Cilt: Giriş ve Başlangıç Hükümleri"
"YFRÇ Yerel Finansal Raporlama Çerçevesi Uygulama ve Yorumları"